Technologically most sophisticated destroyer in the world will manage the namesake of the famous captain of the Enterprise. Although the ship is not named Enterprise, it will be managed by Captain James Kirk, his name is different only by the middle letter between the first and last name. The name of the captain from Zumwalt (DDG 1000) is James A. Kirk, while “Jim” from Star Trek, used the name James T. (Tiberius) Kirk. 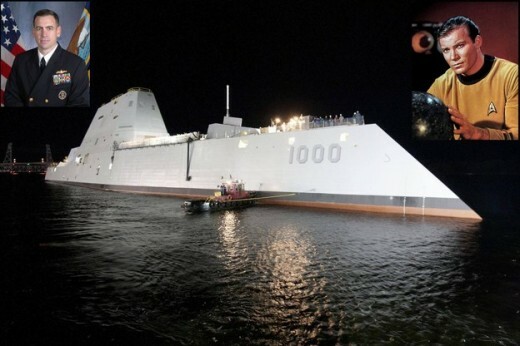 Zumwalt is almost fully computerized and automated, and despite the length of 182 meters, a weight of 14,564 tonnes and the power of advanced weaponry, it can be managed by only 19 crew members, officers and sailors, who will usually sit at their stations where there are only equipped with PCs, monitors, keyboards and other computer equipment. Computer and server infrastructure is provided by IBM. For now it is known that the ship has a launch ramp and 80 “cells” with one or more projectiles that include Evolved Sea Sparrow Missile (ESSM) Tactical Tomahawk Vertical Launch Anti-Submarine Rocket (ASROC), 2 advanced AGS cannon (Advanced Gun System ) of 155 mm, 2 Mk 46 (30mm) cannon, and in ship womb will be transported helicopters SH-60 LAMPS, MH-60R or MQ-8 Fire Scout VTUAV. Ship will possess all the power and advanced technology to detect opponents over long distances and under all conditions (radars, sonars, IR), and gas turbines, it will provide up to 78 megawatts of energy, of which only 20 is intended for navigation, while 58 megawatts are available for weapon systems. The plan is that ship also have railgun and laser cannon, guns that are still in the development of the U.S. Navy, and have reportedly reached the final stage of testing.